THE BOOK OF THE THOUSAND NIGHTS AND A NIGHT. 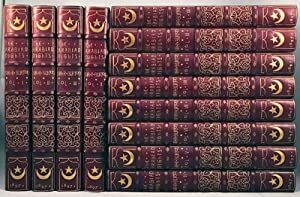 Ten Volumes AND SUPPLEMENT NIGHTS to The Book of a Thousand Nights and a Night. 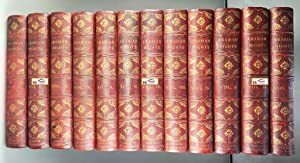 Seven Volumes. Complete Seventeen Volume Set. 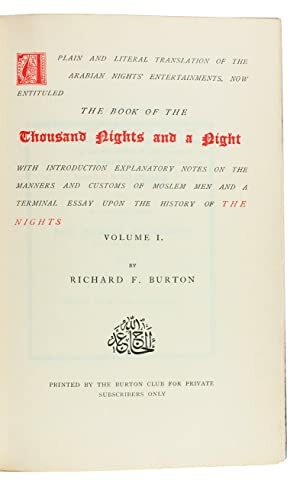 The Book of a Thousand Nights and a Night, with Introduction, Explanatory Notes on the Manners and Customs of Moslem Men and a Terminal Essay Upon the History of The Nights. 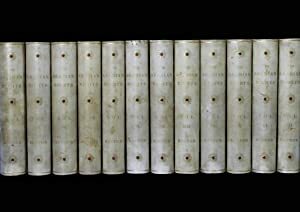 TWELVE VOLUMES. A plain and literal translation of the Arabian Nights' entertainments, now entituled the book of the Thousand Nights and a Night. Including: Supplemental nights.[London? ], Richard Burton Club, [ca. 1910]. 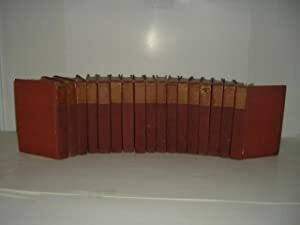 17 volumes. Royal 8vo (24 x 16 cm). With numerous illustrations (including the series by Albert Letchford), each repeated on laid paper (the 17 frontispieces repeated in colour). Contemporary half green morocco, gold-tooled spine. ARABIAN NIGHTS]. BURTON, Richard Francis. A plain and literal translation of the Arabian Nights' entertainments, now entituled the book of the Thousand Nights and a Night. (Including: Supplemental nights). 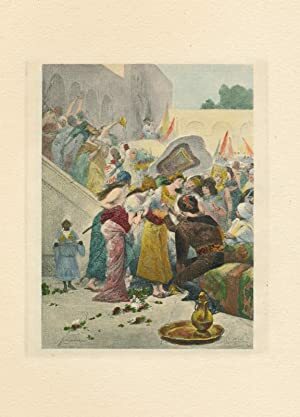 A Plain and Literal Translation of the Arabian Nights' Entertainments, now entituled [sic] The Book of the Thousand Nights and a Night, with introduction, explanatory notes on the manners and customs of Moslem men and a terminal essay upon the history of the Nights. ARABIAN NIGHTS.) BURTON, Richard F.
THE BOOK OF THE THOUSAND NIGHTS AND A NIGHT Complete in 10 Volumes. Together with SUPPLEMENTAL NIGHTS To The Book Of The Thousand Nights And A Night. 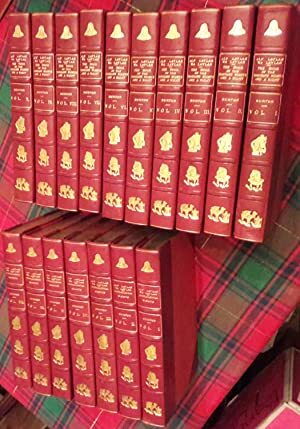 Complete ion 7 Volumes. 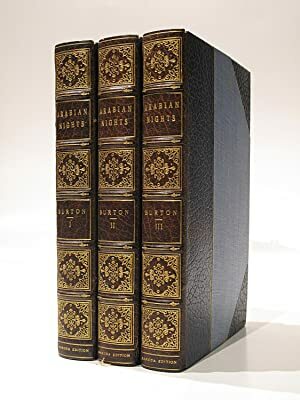 Handsomely Bound in Half Maroon Calf by Bayntun of Bath. The Book of the Thousand Nights and a Night. 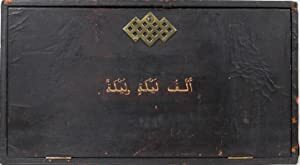 Translated from the Arabic by Sir R. F. Burton. Reprinted from the original edition and edited by Leonard C. Smithers. Illustrated with seventy-one illustrations by Albert Letchford. 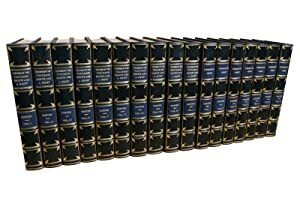 In twelve volumes. 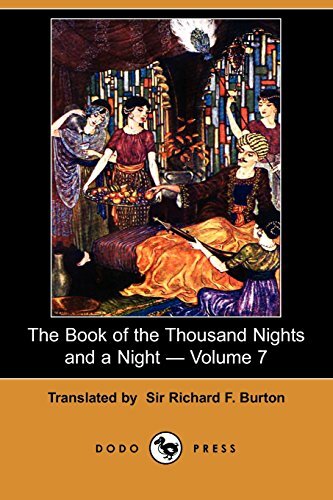 A Plain and Literal Translation of the Arabian Nights' Entertainments, now entitled The Book of the Thousand Nights and a Night, with explanatory notes on the manners and customs of Moslem men and a terminal essay upon the history of The Nights. PLAIN AND LITERAL TRANSLATION OF THE ARABIAN NIGHTS' ENTERTAINMENTS, NOW ENTITLUED THE BOOK OF THE THOUSAND NIGHTS AND A NIGHT. 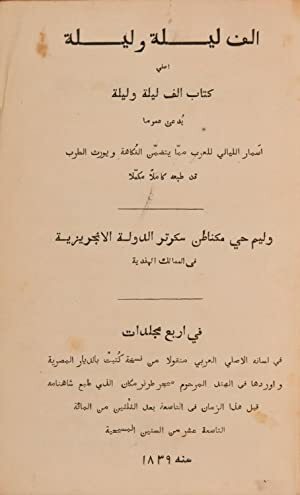 With Introduction, Explanatory Notes on the Manners and Customs of Moslem Men and a Terminal Essay Upon the History of The Nights, (7 Volumes) [with] SUPPLEMENTAL NIGHTS TO THE BOOK OF THE THOUSAND NIGHTS AND A NIGHT. 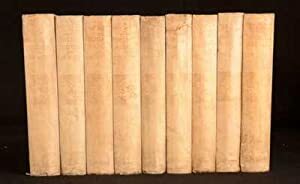 (10 volumes).